I’ll just go straight to the centre of this story: yes, it rained today. A lot. And it was cold. We hit a 13 degree Celsius low point today on our way from Vancouver to Harrison Hot Springs. The day started off quite well in Vancouver, where we went our merry way right after an old fashioned breakfast, American style! Right after this, we went to an IGA to get more groceries, and we were off! It would be a mere 2 hour drive to Harrison Hot Springs, and with our homework done we pretty much knew what to do and where to go. With the day starting very overcast we figured it would clear around noon as it did the day before, but it didn’t. It started drizzling. And then some more. Around 2, the rain stopped and after about 4 hours of rain, of which we spent about 2 at a site called Bridal Falls State Park, we found ourselves inside Minter Gardens taking pictures of a very well laid out garden in a bleek sun. I sure hope the macro fotos will turn out great! Harrison Hot Springs is a tiny place, fully focused on having tourists entertaining themselves on the adjacent Harrison Lake. We’ll see what tomorrow brings us! The journey will take us to Penticton with possibly a lot of lovely nice spots for us to enjoy. Very early in the morning, we got up and got ready for an exciting day. First up: Antelope Canyon. Named after the African animals, the original settlers thought the cattle held by the native Indians were antelope but they were mistaken. The trip was on a huge pickup truck with two rows of seats built in the trunk driven by this petite lady. She picked us up at the hotel and brought us after a stop at their HQ and a 20 minute trip over the freeway to the Indian park of Antelope Canyon. I’m going ti be short on this one too: when in doubt, go there! It’s the best! After checking out from our hotel, we met Mark & Christa who, due to the time difference between Arizona and Utah, were very close by. Seeing them was really weird, but a lovely interruption in our schedule. It’s been great fun guys! 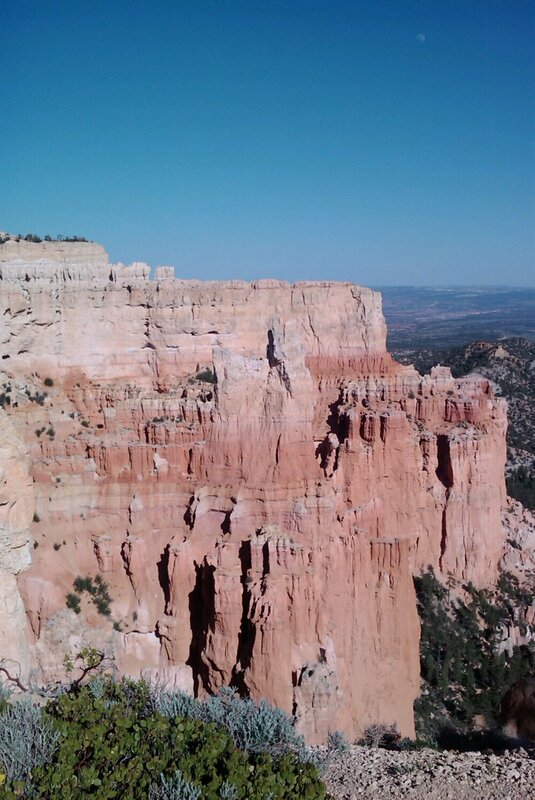 The trip that day lead us to Bryce Canyon. Because of the fact that Bryce Canyon is smack in the middle of the Old Wild West, our hotel, Ruby’s Inn, was built to resemble this era in American history. Either you like it, or you totally dislike it: I found it to be amusing at best.We are there for the scenery, and not for the enjoying of our hotel. Besides: we were there only one night; and a very short one too. Directly after arriving at the hotel, we took off to go see the sun setting over Bryce Canyon as we were told this was very spectacular. I can safely say that, compared to.the sunset at Grand Canyon this was not the case. Yes, we are spoiled! 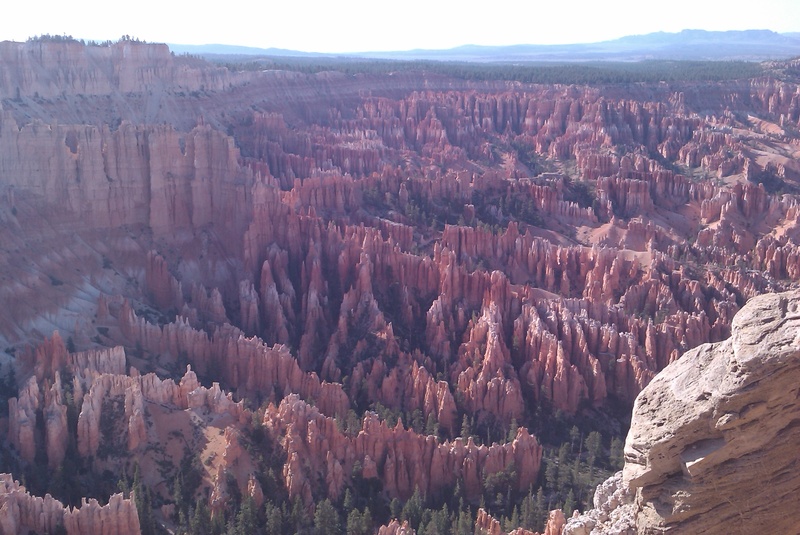 Bryce Canyon is not so much a canyon but more of an eroding mountain where the most spectacular views are of an amphitheatre in the middle. It makes for some very scenic views and a great day out. We immediately drove all 17 miles to the far end of the park and got out at all designated areas. Great pictures were made! Below some I took with my phone. Tomorrow the rest and off to Zion NP!